Heirloom tomatoes at a farmers’ market in San Francisco. Photo: advencap. It is high season for tomatoes right now. Your local farmers’ market probably has a whole color spectrum of heirloom tomatoes, from red to green and purple, deepening to almost black. 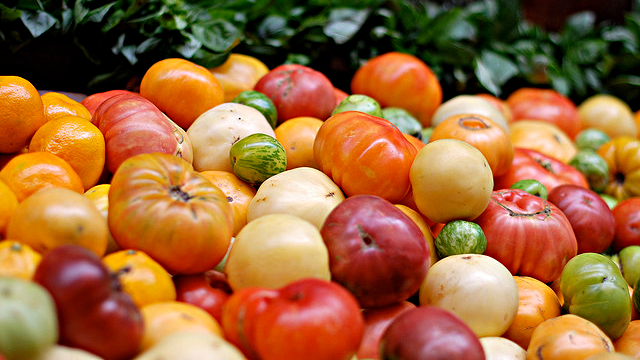 Heirloom tomatoes are getting more and more popular—but what does “heirloom” really mean? And how do these colorful tomatoes differ from their supermarket relatives? What does “heirloom” mean, anyway? In agriculture, the word “heirloom” doesn’t have a precise definition. It conjures up ideas of a food that is old fashioned and has been handed down for generations—which is as good a definition as any right now. Heirloom tomatoes are varieties that have been grown without crossbreeding for 40 or more years. This is in contrast to the typical supermarket tomatoes, which are hybrids that have been carefully crossbred to have particular characteristics. Often flavor is not at the top of the list. Instead, hybrid tomatoes are bred for things like resistance to pests and diseases, and firm flesh and thick skin—so they can be harvested by machines and emerge as whole tomatoes, not sauce. But genetic mixing—or lack thereof—isn’t the only thing that separates the heirlooms and the hybrids. Let’s look at some heirloom tomato myths and truths, to get at other difference between the two tomatoes. You can grow heirloom tomatoes from their seeds. Correct. Hybrid Heirloom tomatoes breed true—if you take the seeds from your heirloom tomatoes, treat them right, and then plant them in the spring, the tomatoes you pluck from the vines in late summer will taste just like their parents tasted. One characteristic of heirloom crops is that they are open-pollinated; pollen is carried by natural mechanisms, like bees or wind. Compare this to commercially grown hybrid tomatoes, which must be pollinated by hand to ensure the correct combination of traits. This is a lot of work, but it’s necessary. Open-pollinated hybrid seeds might carry the good genes for a particular trait, or they might the carry bad genes. The only way to ensure a good crop of hybrids is to plant seeds that have been hand-pollinated so you get the right mix. Not necessarily. Often they are organic, but they would still be called heirlooms if growers treated them with pesticides and other chemicals. And growers would have good reason to spray: heirlooms don’t have the disease and pest resistance that hybrids have acquired over generations of selective breeding. Heirlooms are particularly susceptible to fungus, which makes them crack and split. Farmers growing heirlooms get one-third the yield (or even less) than they would if they were growing hybrids, because so many plants and fruits are damaged by pests and disease. This is one reason why heirloom tomatoes are so expensive. Often this is true, and there are a couple of reasons for it; some are inherent to heirlooms, and some are byproducts of the way they’re grown and harvested. An heirloom tomato plant often produces a total of only two fruits; all the plant’s reproductive efforts get concentrated into just a few tomatoes. This concentrated effort could be making the tomatoes more flavorful. And, heirlooms usually have more locules—the cavities with the seeds—than commercial hybrids. These locules are flavor centers, full of volatile compounds. Hybrids are less flavorful because they were never bred for flavor—although that is changing. Plus, heirlooms are often grown locally and allowed to ripen on the vine, as opposed to typical supermarket hybrids, which are picked when firm and green, and are ripened to redness in a warehouse with ethylene gas. When and how tomatoes ripen affects their flavor. Heirlooms are better for you. False: there is no evidence for this. Heirlooms don’t have more nutrients or anti-oxidants than hybrids. Whether your shopping cart is full of heirlooms or hybrids, whether they’re red or yellow or deep purple, don’t put those tomatoes in the fridge. The cold temperature decreases whatever flavor they may have. Shouldn’t paragraph 4 read: “Correct. Heirloom tomatoes breed true” ? Thanks for catching that, Christopher! Two fruits? Sounds like a copy of the fraudulent scientific american article on heirlooms being no good…. I kept my heirloom seeds, purchased from an online seller over to a second season. The first season crop, grown in Chicago were wonderful. The second season’s crop, grown from seeds from the same packet but in California have grown up to be Plum Tomatoes. None of the color, texture, or flavor of the first years crop. Can you explain this? I’m raising what I’ve been told are….turtle egg tomatoes ….they are very pale…. almost white. Is there anyone out there growing these ? Or any information on them ? I grow only heirlooms and they grow HUNDREDS of fruits per plant. Concentrating production to less tomatoes means bigger fruits not more flavor, but again heirlooms do not yield any less than hybrids, hybrids came from heirlooms, therefor heirlooms can or cannot have single or multiple desired traits from any plant since selective breeding of desired traits came from selecting heirloom tomatoes for hybird selections. I would also like to add that you are incorrect that hybird tomatoes must be pollinated by hand to retain the desired traits. they can be open pollinated from hybird selection. do you think that all of the hybird seeds you buy at the store are hand pollinated?